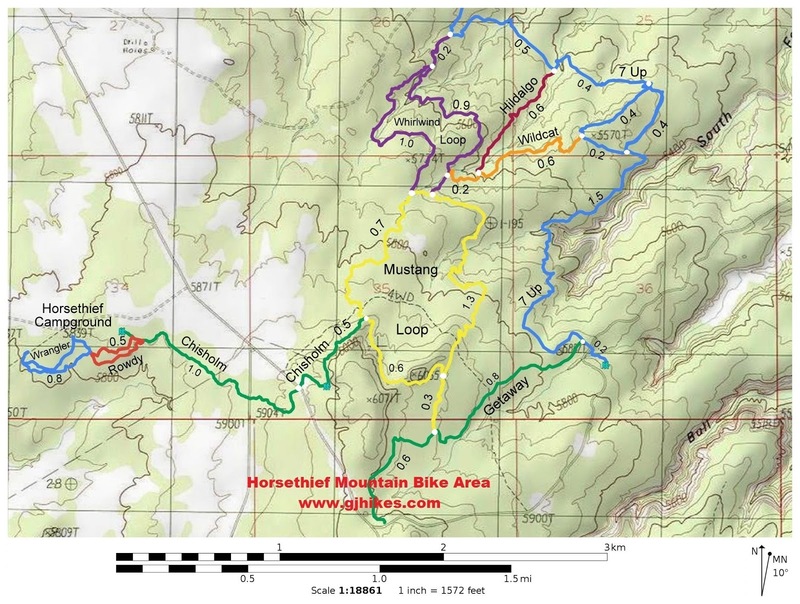 The Mustang Loop is part of the Horsethief Mountain Bike Trails area near Moab, Utah. The trail begins at the end of the Chisholm trail. As it makes its loop it is connected to by the Whirlwind Loop and has a short spur that connects it to the Getaway trail which is part of the Gemini Bridges trail system. With 505 feet of total elevation gain the Mustang Loop provides a good aerobic workout on a intermediately technical trail. This post begins at the end of the Chisholm trail. The arrow on the sign points left for the Mustang Loop. It might seem like that is the suggested direction of travel but a sign later on points in the opposite direction. The trail is open to two-way traffic and for this post we did go to the left. As the trail heads north it descends at a gradual pace. The trail alternates between patches of dirt and slickrock. The west side of the loop is relatively smooth compared to the east side of the loop. For the first mile the elevation change is pretty much all downhill and very fast. The trail's elevation profile shows the long gradual descent and the manner in which it climbs back to where it began. It is a little bit of a workout but not all that noticeable for those accustomed to the Moab area. At the 0.83 mile point the first branch of the Whirlwind Loop takes off on the left. 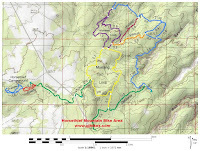 The Whirlwind Loop reconnects to the Mustang Loop in about another 500 feet after having traveled a little more than 2 miles out and around the northern part of the Horsethief area. At the second junction of the Whirlwind Loop it is only about a quarter mile down it to the beginning of the Wildcat trail. From this point onward the Mustang Loop begins getting a lot more interesting as far as the terrain goes. The trail slowly begins regaining some of the elevation that it gave up in the first mile. There are a lot more little twists and turns but the route that the trail takes and its solid construction allow it to avoid most difficulties. 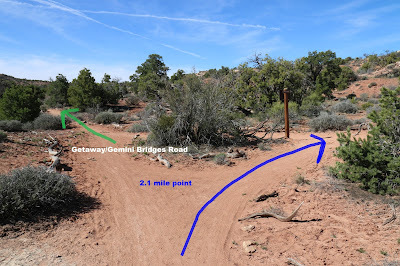 The spur to the Getaway trail comes up just past the 2 mile point. The spur is downhill and about 3 tenths of a mile in length. From the Getaway spur the trail does a little more climbing where it reaches its high point as it travels around a hill that looks like a big turtle from the other side. The last quarter mile of the trail is all downhill. If you don't feel like calling it quits at this point you can do as we did and ride back down to the Whirlwind Loop. 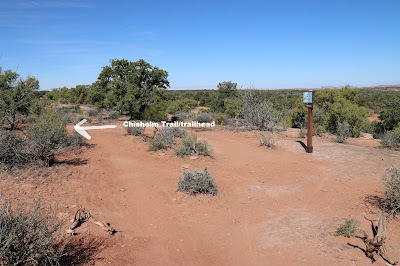 After the Whirlwind Loop we followed the Wildcat trail to 7 Up and took that over to Hidalgo and then back to the Mustang and Chisholm trails to the trailhead. 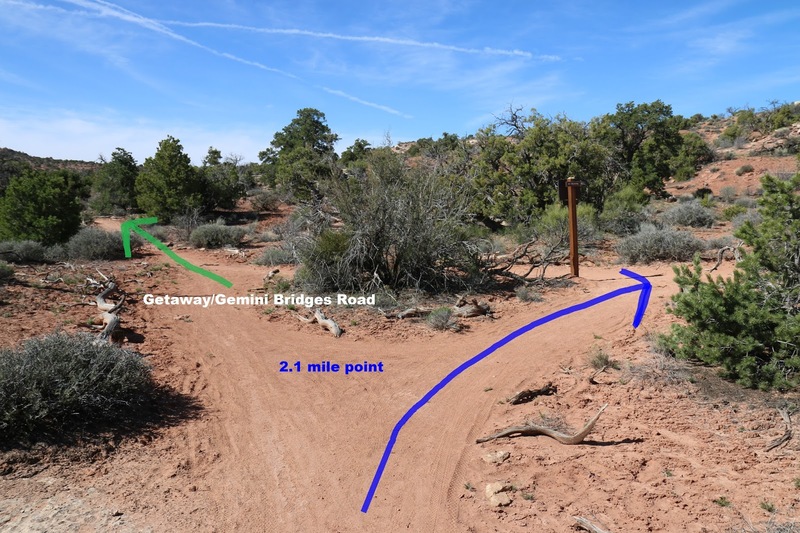 There are enough trails and connecting routes between Horsethief, Navajo Rocks and Gemini Bridges that you can spend a lot of time exploring the area. If you would like to see it for yourself then all you have to do is grab your bike or 'Take a hike'.